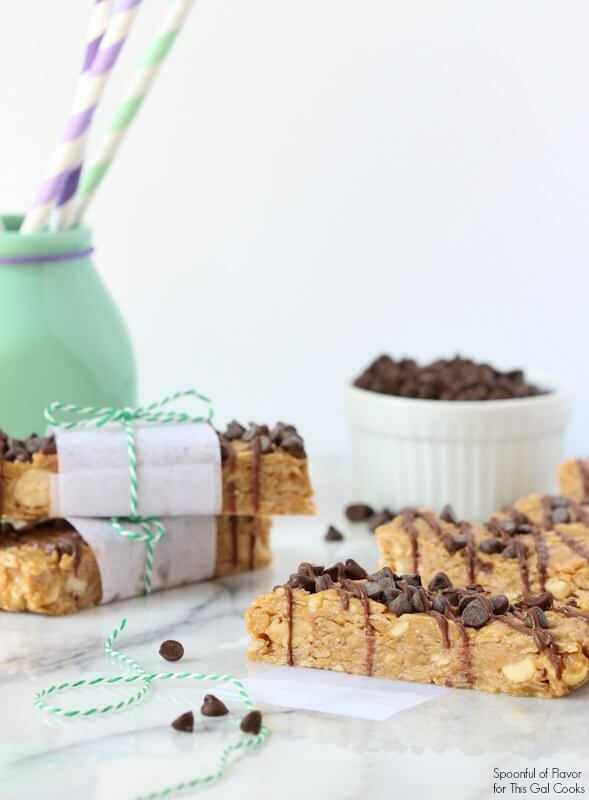 You’re going to love these tasty, No Bake Chocolate Peanut Butter Granola Bars by Ashley from Spoonful of Flavor. They’re the healthy way to start your day! Hi everyone! 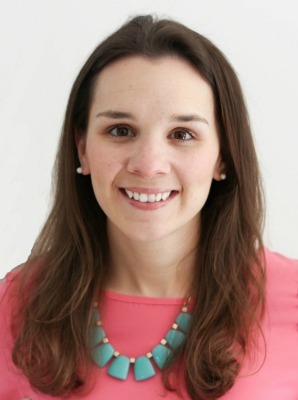 I’m Ashley from Spoonful of Flavor and I am very excited to be guest posting today on This Gal Cooks. I love creating recipes that are easy and perfect for the entire family. I’ve been known to indulge in something sweet every now and then, and you won’t ever find me without chocolate and a stash of snacks. Today, I have the perfect no-bake snack to share with you. These no-bake chocolate peanut butter granola bars are chewy, gooey and loaded with peanut butter flavor. Do you love to snack? Most days, I have an afternoon snack and a post-dinner evening snack. And I always try to include chocolate. In reality, I probably snack more than I should. Sometimes, I don’t actually eat three meals in a day, but rather substitute one of the meals for a few snacks instead. I still try to keep the snacks wholesome and balanced. But as much as I love to bake, during the week, I rarely have time to bake at all. So, I’m always looking for fun no-bake snacks. 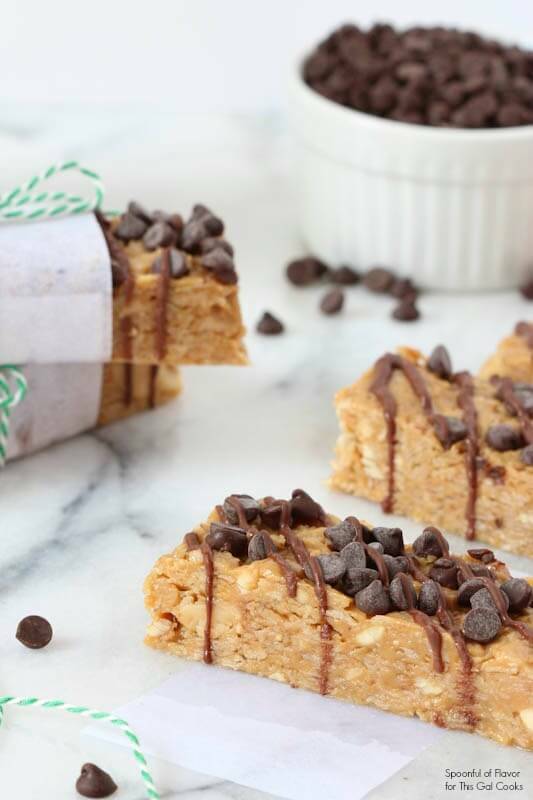 These no-bake chocolate peanut butter granola bars are the perfect snack for the entire family. I love incorporating granola bars into my snack options. And I always try new flavors and varieties. These granola bars are perfect for the peanut butter lover, with a double dose of peanut flavor. Chunks of peanuts and chocolate chips add a subtle crunch. The coconut oil gives them just a hint of coconut flavor and the honey adds a little bit of sweetness. With a chocolate drizzle topping it all off. Best of all, these granola bars are no-bake and can be made ahead of time. I like to make them over the weekend, store them in an airtight container in the refrigerator and then eat them during the week. Go ahead, make yourself a batch and enjoy a fun chocolate peanut butter treat! In a medium pot set over low heat, combine the peanut butter, honey, and ½ cup coconut oil. Stir until smooth and completely melted. Remove from heat and stir in oats and peanuts. Pour mixture into baking dish, spreading an even layer and pressing down firmly with the back of a spatula. Refrigerate for 10 minutes or until cool. Remove from fridge and sprinkle mini chocolate chips over the top of the mixture, pressing down lightly with the back of a spoon to set in granola. Return to refrigerator and chill 2 hours or until firm. Slice into small bars and remove from pan. Thank you for stopping by and checking out Ashley’s recipe, Carrie! These look so good. I need some now! These look so yummy! Great pictures Ashley! I love that blue vase/cup in the background! Oh wow, Ashley: your bars came out perfect, and the chocolate + peanut butter combo is one of my very favorites! I need like 34 of these right now. They’d make such a fabulous school snack! Yummy looking bars Ashley! I could go for one right now! Hope you are having a good vacation Julie! What a great recipe and gorgeous photos, Ashley! I’m not actually a big snacker, but my kids are and would love these! 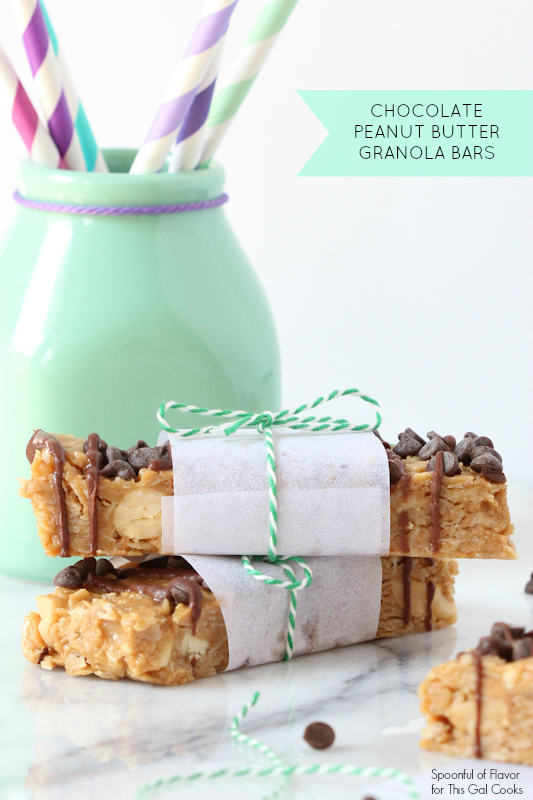 Love these granola bars, they look amazing Ashley! 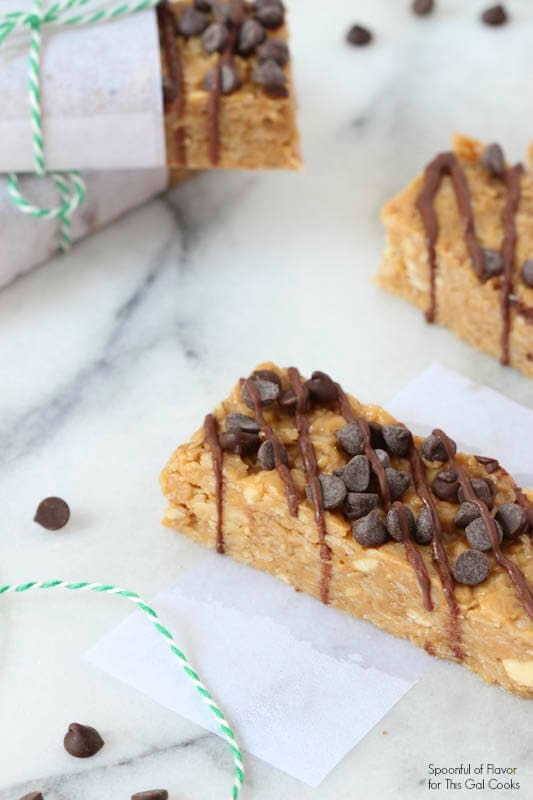 Perfect snack to have on hand and chocolate and peanut butter are an absolute favorite in our house:) Can’t wait to make these! Hope you are having a great vacation so far Julie! Thank you so much for pinning and for stopping by and checking out Ashley’s recipe, Marcie! Ashley these look delicious!! Thanks for having Ashley over to share with us, Julie! Pinned! These Bars look amazing! I just love peanut butter and after seeing this I need to make them! I saw a preview of these on Spoonful of Flavor, they look great to have for breakfast or snack, or just anytime. Ashley I love to make homemade granola bars! Yours look fantastic and I bet taste just as good!! Pingback: 10 Easy Breakfast Bar Recipes to Start Your Day Right! 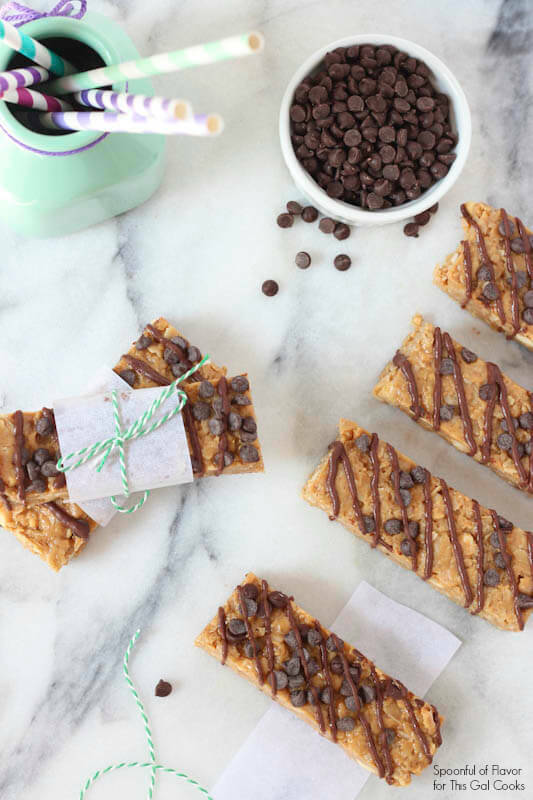 I love making granola bars with peanut butter, coconut oil and honey, and your addition of peanuts in these sounds delicious! Beautiful pics, too! These granola bars are gorgeous! I love Ashley’s blog and of course these look amazing, like all her recipes! Pinning and can’t wait to try! Thank you for stopping by and checking out Ashley’s recipe, Jen! Not only do those look scrumptious, that is some of the very best food photography I’ve seen. Beautiful job!